In November 2017, the Centers for Medicare and Medicaid Services (CMS) announced a new low volume appeals settlement (LVA) option for providers with appeals pending at the Office of Medicare Hearings and Appeals (OMHA) and the Medicare Appeals Council. CMS has announced a call to describe the process on Tuesday, Jan 9 from 1:30-2:30ET. Q&A is not available but questions may be submitted in advance to MedicareSettlementFAQs@cms.hhs.gov. LVA is potentially available to providers that have fewer than 500 Medicare Part A or Part B claim appeals pending at both OMHA and the Council, with a total billed amount of $9,000 or less per appeal, in addition to other conditions. CMS will settle eligible appeals at 62% of the net allowed amount. See CMS’ website for additional details about the LVA option: https://www.cms.gov/Medicare/Appeals-and-Grievances/OrgMedFFSAppeals/Appeals-Settlement-Initiatives/index.html. Despite procedural setbacks, the House is set to send a tax reform bill to President Trump's desk today after the Senate passed its own version on a party-line vote slightly after midnight on Wednesday morning. The House already passed a reform package late in the day on Tuesday but must hold another vote after it was discovered there were provisions in the bill that violated Senate rules. The reconciliation process Congressional Republicans are using to avoid a Senate filibuster from Democrats dictates that legislation must follow a strict set of budgetary rules. The Senate stripped out the portions that violated the so-called “Byrd Rule” and sent a revised version back to the House. The final bill expected to pass preserves private activity bonds and the medical expense deduction, two provisions AHCA/NCAL said should be included. The initial House version passed earlier this year eliminated these important tax resources for non-profit providers and long term care patients but revisions later reinstated the provisions. The potential legislative victory for Congressional Republicans is overshadowed by lingering disputes on year-end government funding and spending deals. Unlike tax reform, Republican leadership will need help from Democrats to pass funding bills through the Senate, and Democrats have threatened to pull their support unless specific provisions are included, such as funding of health insurance subsidies. Meanwhile, it does not seem as if the House version of any spending package will include the provision to help the insurance markets created by the 2010 health care law that still remain controversial with conservative Republicans. If the House passes a bill without the cost-sharing subsidy and leaves for the Christmas holiday, Senators could be forced to vote for a less-optimal bill or shut down the government. Negotiations over tax reform have left little time for Congressional leadership to reconcile differences between the two chambers: the deadline for funding is December 22. The Department of Health and Human Services (HHS) Office of Inspector General (OIG) issued an advisory opinion (No. 17-08) regarding a company’s written proposal to develop a state-wide network of nursing facilities that would provide discounts on the daily rates they charge to private long-term care insurers and the insurers’ policyholders. The OIG concluded that it would not impose administrative sanctions under the anti-kickback statute or the civil monetary penalties provision of the Social Security Act because the risk of improper inducement, fraud, and abuse was sufficiently low under the proposed plan. A startup company was proposing to develop a network of nursing facilities that would provide discounts on the daily rates they charge to private long-term care insurers that contracted with the company and with participating payors’ policyholders. Facilities that maintain a quality rating of 3 stars or higher on the CMS Nursing Home Compare website and that agree to provide a set discount off of its daily private payor rate for a semi-private room covered by the participating payor, would be eligible to join the network. Two-thirds of the discount would be allocated to the participating payor’s liability and one-third would be allocated to any amount the policyholder would owe to the facility. Each time a participating payor receives a discount from a facility, the participating payor would pay the startup company a fee for administrative services. Description: Legionnaires’ disease is caused by a type of bacterium called Legionella. Those at risk include persons who are at least 50 years old, smokers, or those with underlying medical conditions such as chronic lung disease or immunosuppression. Outbreaks have been linked to poorly maintained water systems in buildings with large or complex water systems including hospitals and long-term care facilities. Transmission can occur via aerosols from devices such as showerheads, cooling towers, hot tubs, and decorative fountains. CMS expects Medicare certified healthcare facilities to have water management policies and procedures to reduce the risk of growth and spread of Legionella and other opportunistic pathogens in building water systems. This webinar will review the necessary steps to take and resources available to support your efforts in developing these prevention and management systems and processes. Deadline Approaching: RSVP to the Quality Initiative Recognition Program Luncheon Today! Quality Initiative Recognition Program achievers will be recognized at the AHCA/NCAL Quality Summit in New Orleans, March 12-14, 2018. The deadline to RSVP for the AHCA/NCAL Quality Initiative Recognition Program luncheon at the 2018 Quality Summit is approaching fast! Email qualityinitiative@AHCA.org to reserve your spot by January 31, 2018. 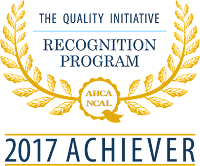 A full list of achievers is available on the AHCA/NCAL Quality Initiative Recognition Program website here and here. There are 17,997 open jobs posted by direct employers in the nursing care facility (including SNFs), assisted living, and continuing care retirement community (CCRC) sectors this month according to the latest CEB TalentNeuron statistics. That is a decrease of nearly 700 openings since November and more than 2,200 fewer posted long term care (LTC) positions in October. The CEB TalentNeuron statistics also show an estimated 2,101,000 potential candidates in the nation’s workforce whose skills likely match the qualifications being sought by long term care employers. Figures show that 1,749 direct employers are competing for candidates this month – about the same number as last month. The average number of days a job was posted this month increased by one day to 36 days. Finding qualified employees is one of the greatest challenges facing long term care providers. The AHCA/NCAL Long Term Care Career Center is designed to help members be competitive in attracting qualified candidates to fill their health care job vacancies. The LTC Career Center is also fully integrated with Google’s new job search feature “Google for Jobs” creating even greater exposure for job postings. Of course, the LTC Career Center is always free for job seekers and the LTC Career Center features many of the best positions the long term care profession has to offer. Job seekers are using the site with more than 95,000 searchable resumes on the National Healthcare Career Network this month – an increase of more than 2,000 candidates from November. Job postings on the AHCA/NCAL Long Term Care Career Center network are averaging more than 1,400 views in December. Be confident that you have an emergency preparedness plan that correlates to the new CMS guidelines. Order the customizable EPP plan today through the AHCA/NCAL Bookstore and save $100 off the regular $495 price. On December 19, 2017, the U.S. House of Representatives’ Committee on Veterans’ Affairs considered and approved legislation by a vote of 14-9 entitled the VA Care in the Community Act (H.R. 4242). This legislation establishes a veterans community care program, and ensures that extended care providers, including nursing centers, can legally enter into VA Provider Agreements. As noted in previous AHCA communications, the Senate Committee on Veterans’ Affairs marked up their version of the legislation last month entitled Caring for our Veterans Act of 2017. As you may know, AHCA endorses legislation introduced earlier this year entitled, the Veterans Access to Long Term Care and Health Services Act (S. 1611/H.R. 4113). This legislation, introduced by Senators John Hoeven (R-ND) and Mike Rounds (R-SD) and by Congressman Bruce Poliquin (R-ME-02), would ensure that extended care providers, including nursing centers, can legally enter into VA Provider Agreements, and would be subject to the same rules and regulations as any other Medicare or Medicaid provider. Under S. 1611/H.R. 4113, the number of facilities serving veterans will increase in most markets once qualified providers are able to enter into VA Provider Agreements, broadening options among veterans for nursing center care and home and community-based services. Both the U.S. Senate and House Committees on Veterans Affairs approved legislation noted above includes some, but not all, of the provisions from the Veterans Access to Long Term Care and Health Services Act. AHCA will keep its members apprised of next steps as work continues on the Hill efforts around VA Provider Agreements. If you have any questions, please contact AHCA’s Senior Director of Not for Profit & Constituent Services, Dana Halvorson. 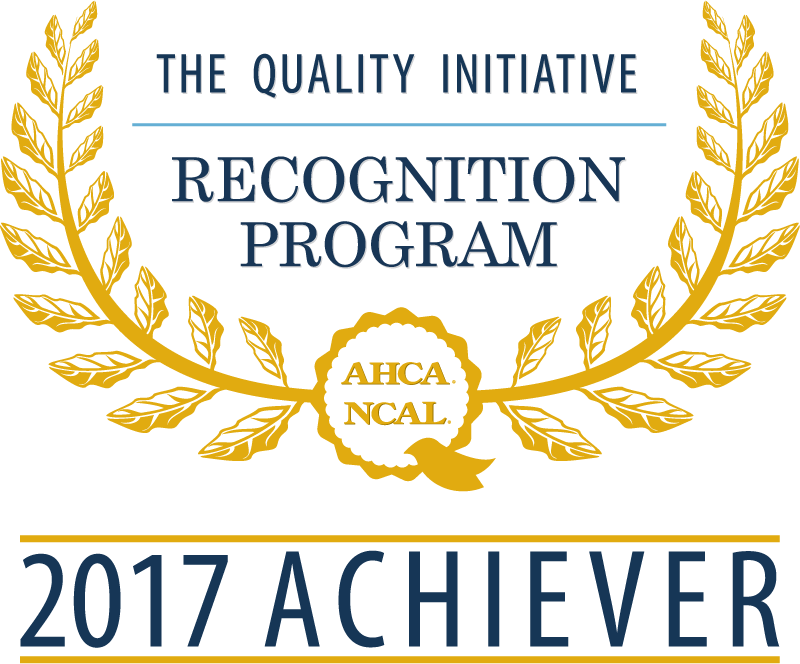 At the end of November, AHCA/NCAL announced the achievers of the 2017 Quality Initiative Recognition Program (QIRP). For a skilled nursing facility to be recognized, it had to achieve four or more of the Quality Initiative goals as of Oct. 13, 2017. There were 1,509 members (16%) who met this threshold. If we map where these achievers are located, we see they are quite evenly spread out across the nation. As you can see in the figure below, the vast majority of states have between 10 to 20 percent of its members as QIRP achievers. Georgia leads the way at 38 percent and Alabama is within the top five at 28 percent. Because the AHCA Quality Initiative includes goals that depend on care transitions and proper follow-up, such as reduced rehospitalizations and increased safe discharge to the community, broader health factors, like access to primary care that can exacerbate chronic conditions, are potential barriers that need to be addressed to succeed. Based on the distribution of QIRP recipients, AHCA members are improving the care and lives of the people they serve regardless of underlying health factors that may exist. For more information on latest results on the Quality Initiative, check out this progress snapshot. On December 12, LTC Trend Tracker users should have received the latest Your Top-Line publication, produced by LTC Trend Tracker, in their email inboxes.The report was sent with the subject line, "LTC Trend Tracker Quarter 4 Publication". The resource highlights metrics and graphics outlining your facility's progress on Five-Star performance, the AHCA/NCAL Quality Initiative, and other necessary data to help you achieve your desired goals. The 2017 Quarter 4 edition of Your Top-Line publication also includes each facility's current Quality Award status, and information regarding the eligibility criteria for all levels of the Quality Award journey. LTC Trend Tracker has a new and improved Five Star Predictor Tool that allows users to see how potential changes in individual quality measures may impact that center's Five-Star QM rating. Users can enter potential rates for each individual QM to predict how that change will affect the facility's Five-Star QM total points and rating. Questions about LTC Trend Tracker may be sent to help@ltctrendtracker.com. On November 28, 2017, Phase 2 of the Requirements of Participation (RoP) was implemented, along with new F-Tags associated with all requirements, new interpretive guidance, and a new survey process. New requirements that went into effect on November 28 include the facility assessment, behavioral health requirements, baseline care plan, quality assurance and performance improvement (QAPI) plan, and antibiotic stewardship program. The new survey process, or Long Term Care Survey Process (LTCSP), has now gone into effect nationwide. The magnitude of these changes creates many challenges and concerns for nursing centers. Throughout this year, AHCA has worked to support and advocate for members with implementation of the requirements and the new survey process. We provided training through full-day workshops on Phase 1 and Phase 2 of the RoP across the country as well as recorded webinars such as this webinar on Preparing for the New Survey Process and RoP Phase 2. We built an ever-expanding library of implementation resources, including Action Briefs on regulatory topics from pharmacy services and physical environment, tools and checklists, templates shared by members, as well as “must view” materials such as AHCA’s RoP Playbook. Member owners and CEOs are encouraged to register for a new three-part webinar series that helps break down what an owner or CEO needs to know about the new regulations that went into effect on November 28. All of these resources, tools, and webinars are available to members on the RequirED section of ahcancalED, AHCA's education portal. AHCA has also advocated for and achieved some meaningful relief from some of the burdens created by the implementation of such fast-paced regulatory change. For example, the Centers for Medicare & Medicaid Services (CMS) has implemented an 18-month moratorium on imposing certain enforcement remedies, including civil monetary penalties, for specific Phase 2 requirements. CMS has made available to providers web-based training in the new survey process, including this overview of the LTCSP for providers and this review of the new LTCSP Procedure Guide for surveyors that walks through each step of the LTC survey process. Looking ahead to 2018, AHCA will continue to focus its efforts on finding further solutions that help you provide quality care. We will be seeking your feedback on the implementation of Phase 2 and the new survey process in your states and centers so we can provide input to CMS and inform future changes. We hope you will join us at this year’s Quality Summit in New Orleans, LA from Monday, March 12-Wednesday, March 14. During Quality Summit, we will provide educational sessions and opportunities to network and share best practices. Sessions on topics such as transitions of care, infection control and antibiotic stewardship, and how to utilize data from LTC Trend Tracker will help you improve practices and processes within your centers to help you succeed in implementing the new requirements. Please contact Sara Rudow with any questions or visit AHCA's RoP webpage for more information. Networking, hospitality receptions, and more! Rooms are going quickly so reserve your room now. The housing deadline is February 9, 2018. You must be registered for the conference before housing reservations can be made. Housing reservations can be done at the same time when registering online. Thank you to our event sponsors: Medline and Genesis Rehab Services. Register for this year's conference and gather in New Orleans with other Independent Owners (IOs) from around the country. It's the gift that keeps on giving. You'll take home ideas, strategies, and inspiration that will help you and your staff provide excellent quality care throughout the year. Opening General Session: Glenn Van Ekeren of Vetter Health Services will inspire you with strategies for moving your team forward. He specializes in leadership development, personal growth, professionalism, team building, dealing with change, and developing high-performance people. Closing General Session: Jessica Cox, the first armless pilot, embodies the spirit of adaptability and provides valuable insights on how best to approach a challenge. Listen to her journey of learning to fly with her feet. Convinced that the way we think has a greater impact on out lives than our physical constraints, she is internationally known for her inspiring message. Get more details and register today! NAB Creates National CE Registry – Sign up for your Free Registry Number Today! NAB (National Association of Long Term Care Administrator Boards) is creating a National CE Registry that will be the first of its kind and will be free of charge to long term care licensees. This system will enable you to track both CE approved by NAB’s National Continuing Education Review Service (NCERS) and non-NCERS approved CE. Once your license is due, you simply release your registry to your state board/agencies electronically (please note that some states have mandatory electronic reporting systems that might still be required). NOTE: Beginning April 1, 2018, all NAB approved NCERS providers will be required to report credit to the CE registry. Administrators must register for the NAB CE Registry ID no later than April 1, 2018 in order to receive CE certificates from NCERS sponsored events and classes. IMPORTANT: In order to register for the 2018 AHCA/NCAL Annual Convention & Expo and all AHCA/NCAL conference and conventions from April 1, 2018 and beyond, you will be required to have a CE Registry number. Please take a moment to learn about the program and establish your CE Registry number. If you have an assistant who registers you for AHCA/NCAL events, please be sure they know your CE Registry number. You will not be able to complete a registration without the number. Helpful links can be found below and questions can be directed to NAB via email at - nab@nabweb.org. If you have questions, please contact NAB directly – nab@nabweb.org. As you know from previous AHCA/NCAL communications, on November 2, 2017, the Republican leadership of the U.S. House of Representatives introduced the Tax Cuts and Jobs Act. This bill proposes to eliminate the use of private activity and advance refunding bonds beginning on Jan. 1, 2018. The elimination of private activity debt instruments would significantly and adversely impact the ability for the majority of our not for profit members to fund new construction, infrastructure improvements, acquisitions and other capital expenditures for their operations, including skilled nursing, assisted living centers and many affordable housing projects (impacting our for-profit providers as well). The Tax Cuts and Jobs Act also includes repealing the medical expense deduction. AHCA/NCAL joined an AARP-led Coalition to preserve the medical expense deduction. AHCA/NCAL opposes both the elimination of private activity bonds, along with the repealing of the medical expense deduction. On November 9, the Senate Republicans released their own tax reform plan. This plan would preserve private activity bonds, but advance refundings would still be terminated after this year. The Senate proposal also preserves the existing medical expense deduction and enhances the standard deduction for the blind and elderly. Last Friday, AHCA/NCAL and several other national organizations that are part of the AARP-led Coalition sent a letter to the tax reform House and Senate Conferees on the medical expense deduction provision. As House and Senate negotiators continue to work to try to blend the legislation passed by each chamber, AHCA/NCAL will keep its members posted of any relevant updates. HealthCap is endorsed by AHCA/NCAL and is the premier program solely dedicated to providing liability insurance to senior care communities. HealthCap clients have the fewest liability claims in the industry and HealthCap settles claims for half the industry average. One of the reasons HealthCap gets such great results is its focus on quality care as the foundation of good risk management practices. A new blog written Erica Holman, a senior risk manager at HealthCap, discusses the latest developments in the detection of Lewy Bodies disease, including the newest list of major symptoms developed by Lewy Body experts. The blog also discusses non-pharmacologic therapies and provide actionable best practices long term care professionals can follow. HealthCap is owned and governed by the senior care providers insured by HealthCap. AHCA/NCAL members get a bonus advantage by always receiving a 10% discount on their HealthCap premiums. For more information about HealthCap, email Stephanie Hale at stephanie.hale@chelsearhone.com or call (877) 855-4227. The American Health Care Association (AHCA) is ready to help members meet the new infection prevention and antibiotic stewardship requirements now being enforced by CMS for the Reform of Requirements of Participation for Long Term Care Facilities. AHCA’s Infection Preventionist Specialized Training (IPCO) course provides education for healthcare professionals who seek to serve as Infection Preventionists and prepares individuals to meet the antibiotic stewardship requirements that took effect on November 28. As of November 28, 2017, the federal requirements for nursing facilities expand further and require that every nursing facility develop and implement an antibiotic stewardship program. This is a new requirement that should be conducted with oversight from specially trained healthcare professionals. Surveyors nationwide have been trained and are now surveying for these expanded infection prevention & control and antibiotic stewardship requirements. AHCA’s course is an online, self-study program with 23 hours of training that meets the educational requirements outlined by CMS. It includes online lectures, case studies and interactive components taught by subject matter experts who have real life experience working in long term/post-acute care. The AHCA/NCAL Long Term Care Career Center helps employers fill their health care job vacancies. Rates for posting job vacancies are affordable and give prospective employers far greater exposure than local ads and job boards by connecting to a network of more than 330 national and state health care organizations and societies and more than 95,000 searchable resumes this week. As a leading employment information resource, the AHCA/NCAL Long Term Care Career Center has been fully integrated with Google’s new job search feature “Google for Jobs.” Our partnership with Google’s new initiative will deliver success for AHCA/NCAL members, job seekers and other related employers in the long term care industry. The LTC Career Center features many of the best top positions available in the long term care profession and is always free for job seekers. And, job seekers are using the site! Job postings on the AHCA/NCAL Long Term Care Career Center, average more than 1,400 views a month. Members of Congress have only a few days to come up with solutions to many must-pass deals and 2017 priorities. Lawmakers are facing a December 22 deadline for a government funding bill rife with complications as well as pressure from Republican leadership to pass a tax reform plan through both the House and Senate. Democrats and Republicans compromised earlier this month, passing a short-term stop gap measure to extend government funding from December 8 to December 22 but it is unclear if another deal can be struck. Because of budgetary restrictions, another stop gap measure could trigger additional cuts that both parties want to avoid. Competing priorities between the parties are preventing a more comprehensive deal from coming into focus. Republicans would like to ensure long term defense spending, among other provisions, while Democrats have threatened to not support any legislation that does not include measures such as funding the Children’s Health Insurance Program (CHIP) or dealing with recent executive actions on immigration. Additionally, lawmakers are working on a package to refund a series of Medicare programs known as “extenders.” The House Committee on Ways and Means announced in November a bipartisan plan to extend or make permanent the Medicare payment policies, including therapy caps, but uncertainty still exists on how to pay for the package. The extenders were funded by the Medicare Access and CHIP Reauthorization Act (MACRA) of 2015 through the end of December. This all comes at a time where many on Capitol Hill are still entirely focused on the tax plan that passed the Senate at the beginning of December. House and Senate members are currently in a legislative conference to reconcile the differences between the two chambers’ versions of the bill. Republican leadership has stated they’d like both chambers to pass a final bill as early as next week. The tax timeline is overshadowed by the Alabama special election, where a Democrat, Doug Jones, was selected over the Republican candidate, Roy Moore, to replace Jeff Sessions, who vacated the seat to become Attorney General. Jones is expected to be sworn into the Senate after the winter holiday, reducing the Republican margin in the Senate to 51-49 and narrowing the chances of successful passage of Republican priorities. The Medicare Payment Advisory Commission (MedPAC), a nonpartisan legislative branch agency that provides the U.S. Congress with analysis and policy advice on the Medicare program, met last week to discuss post-acute payment. As per MedPAC’s annual discussion, an overview of the industry is presented. In 2016, there were approximately 15,000 SNF and 1.6 million beneficiaries who used SNF services. Of the Medicare stays and spending, 11% of days were attributed to Medicare fee-for-service and 20% of revenues. MedPAC reported SNF margins have decreased slightly year over year. See Chart 1, below. Wide variation in margins reflected differences in patient selection, service provision, and cost controls. Direct the Secretary to report to the Congress on the impacts of the revised PPS and make any additional adjustments to payments needed to more closely align payments with costs in FY 2021. For more detail, find the full summary here. On December 12, LTC Trend Tracker users should have received the latest Your Top-Line publication, produced by LTC Trend Tracker, in their email inboxes. The report was sent with the subject line, "LTC Trend Tracker Quarter 4 Publication". This resource highlights metrics and graphics outlining your facility's progress on Five-Star performance, the AHCA/NCAL Quality Initiative, and other necessary data to help you achieve your desired goals. Have questions about LTC Trend Tracker? Contact the team at help@ltctrendtracker.com! The National Quality Award Program has honored over 4,000 centers across the country with a Bronze award, 767 centers with a Silver award, and 31 with a Gold award since the program’s inception. The tenets of the program are based on the esteemed Baldrige Performance Excellence Framework, which is known for its unwavering focus on excellence. At times, centers might feel it’s difficult to achieve this rigorous and demanding set of criteria. The story of Mountain Valley, available exclusively to members on ahcancalED through a new six-part webinar series, shows how it’s possible. Mountain Valley began its quality journey by participating in the AHCA/NCAL National Quality Award Program, receiving the Bronze award in 2005, the Silver award in 2007, and finally the Gold award in 2011. In 2016, the center achieved an even higher level of recognition – Mountain Valley was the first and only long term care center ever to receive the Malcolm Baldrige National Quality Award – thus far. Members can access this series through ahcancalED here. Questions may be submitted to qualityaward@ahca.org. Submissions for the 2018 National Quality Award Program are now being accepted online! Application packets are available on the Bronze, Silver and Gold award web pages. All applications and payments must be submitted via the online portal before February 1, 2018 at 8 p.m. EST. SNF applicants will need their six-digit Federal/Medicare Provider Number to submit their application. NCAL applicants can write N/A for this field. Double check that the organization name is exactly the same for both fields. The organization name you submit will be the name printed on your award, if selected to be a recipient. If you have a parent company, please double check if there is specific way your center name should be written. Characters and spaces need to be exactly the same in order for a successful submission. Extra spaces may cause an error message. When your application is submitted successfully, applicants will receive confirmation of submission both on screen and through one automatic email. If the email is not received, contact Quality Award staff. Payments must be made online via credit card. Checks are not accepted. If you would like to review your center's award history or have any questions, please email qualityaward@ahca.org. 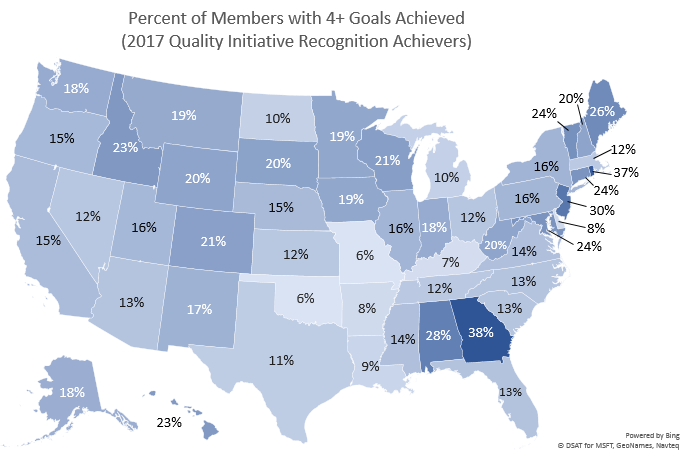 Last month, AHCA/NCAL recognized more than 1,575 skilled nursing care centers and assisted living communities nationwide through the organization’s Quality Initiative Recognition Program, which honors member facilities for their individual work in achieving AHCA/NCAL Quality Initiative goals. The 1,509 skilled nursing center achievers attained four or more of the eight outlined AHCA goals, and the 66 assisted living community achievers attained two or more of the four outlined NCAL goals. Program achievers will be recognized at the AHCA/NCAL Quality Summit in New Orleans, March 12-14, 2018. As a reminder, all achievers must RSVP for the AHCA/NCAL Quality Initiative Recognition Program luncheon at the 2018 Quality Summit by January 31, 2018. Achievers can email qualityinitiative@AHCA.org to reserve a spot. In 2012, the Association launched the Quality Initiative as a national e­ffort to build upon the existing work of the long term and post-acute care profession. The initiative aims to further improve quality of care in skilled nursing centers and assisted living communities by challenging members with specific, measurable targets. All skilled nursing center and assisted living community achievers can use resources available on both AHCA/NCAL Program websites including the template press release here and logos here to promote their accomplishments. On November 29, 2017, the U.S. Senate Committee on Veterans’ Affairs considered and approved legislation entitled, Caring for our Veterans Act of 2017. This legislation establishes a veterans community care program, and ensures that extended care providers, including nursing centers, can legally enter into VA Provider Agreements. The legislation would next go to the full U.S. Senate for consideration. The U.S. House of Representatives’ Committee on Veterans’ Affairs has not held a mark-up of their own proposal as of yet. As you may know from previous AHCA communications, AHCA endorses legislation introduced earlier this year entitled, the Veterans Access to Long Term Care and Health Services Act (S. 1611/H.R. 4113). This legislation, introduced by Senators John Hoeven (R-ND) and Mike Rounds (R-SD) and by Congressman Bruce Poliquin (R-ME-02), would ensure that extended care providers, including nursing centers, can legally enter into VA Provider Agreements, and would be subject to the same rules and regulations as any other Medicare or Medicaid provider. Under S. 1611/H.R. 4113, the number of facilities serving veterans will increase in most markets once qualified providers are able to enter into VA Provider Agreements, broadening options among veterans for nursing center care and home and community-based services. The U.S. Senate Committee on Veterans Affairs approved legislation noted above includes some, but not all, of the provisions from the Veterans Access to Long Term Care and Health Services Act.